It’s one of France’s most powerful religious, architectural and cultural symbols—and images of Notre-Dame de Paris in flames evoke questions about how the city, and the cathedral, will move forward. But the fire isn’t the first time the cathedral has faced destruction. In the 1790s, revolutionaries and angry mobs looted the church and even declared that it wasn’t a church at all during a bloody push to remove France’s close ties to the Catholic church. Before an angry revolutionary mob stormed the Bastille in Paris in 1789, the Church wielded extraordinary power in France. The vast majority of French people were Catholic, Catholicism was the state religion, and the Church owned vast swaths of property and collected heavy tithes from most people’s incomes without paying taxes of its own. But a growing number of French people had tired of the Church’s almost inconceivable power. As the monarchy toppled, then fell, a small group of radical revolutionaries who had been influenced by Enlightenment-era philosophies of freedom of religion and a reason-based society saw their chance to strip the Church of much of its authority. They embarked on a dechristianization campaign, confiscating Church property, trying to get all clergy to swear their loyalty to the new state, and removing the Church’s control over the birth, death and administrative records it had held for so long. The Revolution gained steam, and so did its attempts to strip the Catholic Church of its authority over French life. Parisians massacred jailed priests during the September Massacres of 1792, and clergy were put on trial during the Reign of Terror. In 1793, the new government announced that public worship was illegal. In response, people rushed into churches, stripping them of religious symbolism. 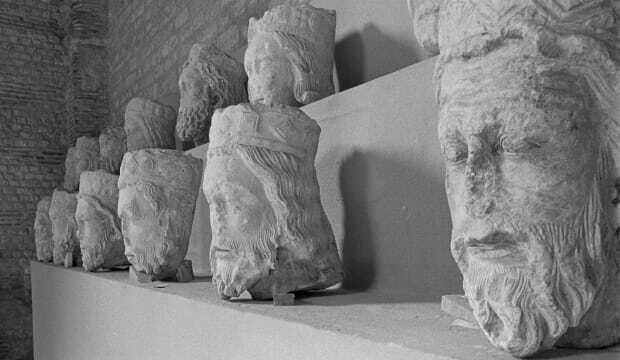 Pieces of the statues of the kings of Judah which adorned the facade of Notre Dame, that had been missing since the French Revolution, shown at a museum in 1977.